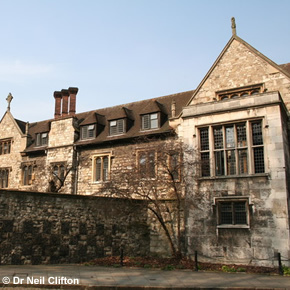 Sutton's Hospital in Charterhouse was originally a Carthusian Priory (1371-1538). 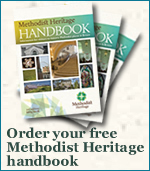 After a period as a private Tudor mansion, it became, in 1611, a school and an almshouse. John Wesley was a scholar at the school between 1714 and 1720 before he continued his education at Christ Church, Oxford. A plaque and a statue commemorating him can be found in Chapel Cloister. Charterhouse School moved to Godalming in Surrey in 1872 and today Sutton's Hospital is home for the Brothers of Charterhouse, a community of 40+ retired single elderly men. In early 2017 the Charterhouse opened its doors to the public for the first time in its 660 year history. The Charterhouse museum is free to visit. There are two different tours available to those wish to explore the historic site, a standard one hour professional guide led tour (£10 per person), and a longer tour led by one of the resident Brothers (£15 per person). Please see our website for booking information (http://www.thecharterhouse.org/visit-us/book-a-tour/) or phone 0203 818 8873. Holy Days and Saints Days: In addition to Morning and Evening Prayer, Holy Communion is celebrated, either in the Chapel at 9.45am or in St Bruno's Chapel, Queen Elizabeth II Infirmary, at 11.00am. The museum is open from Tuesday to Sunday from 11am with last admission at 4.45pm. All worship services are open to the public. Also a programme of evening Musical Tours is offered – see website for details and cost. Bus: Buses stop on Aldersgate Street, near Carthusian Street. Car: Vehicles enter Charterhouse via the car park in Charterhouse Square, leading from Carthusian Street. Metered parking is available in Charterhouse Square.